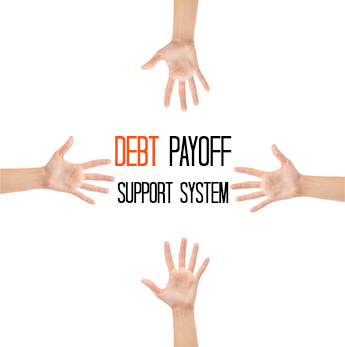 Do You Have a Debt Payoff Support System? Home / Debt / Do You Have a Debt Payoff Support System? Debt is often very difficult to handle. Indeed, debt affects more than your finances; it can also affect your emotional wellbeing and impact your relationships. As you tackle debt, it is important that you have a debt payoff support system. Do your best to find people that can help you stick with your goal while providing emotional support. Who’s in Your Debt Payoff Support System? All of these people impact how you spend your money, and drafting them to your cause can help you see a reduction in spending, and an increase in saving behaviors that can help you pay down your debt. Look for people in your life who normally support you in other aspects. To whom do you turn when you need help? These are likely the same caring people who can help you in your efforts to pay down debt. Choose carefully, though. Not everyone in your life is going to be able to support you in your efforts. Try to avoid toxic acquaintances who might make fun of you or constantly criticize you for past mistakes, rather than helping you move forward as you make better decisions for now and the future. Once you have an idea of those you can count on in your debt payoff support system, it’s time to share your goal. Letting others know that you are in debt can be a painful process. However, if you want support, you will need to share at least some of the particulars. For some members of your support system, you will have to be detailed. A life partner will have to know the details of your debt – how much there is, and how you plan to pay it down. Your debt goal should be decided upon with the help of your life partner. It can be a hard conversation to have, but you need to be on the same page. You can also ask your children to help by sharing your conviction that you want to provide a better financial future for the whole family, and asking your children if they can help. Encourage them to be creative in their efforts. Let them know what is happening in a way that is age appropriate. Perhaps they can craft a debt payoff thermometer for you! For those outside the reach of your immediate family, there is no reason to go into deep detail about your situation. Share your goal simply by letting friends and extended family know that you are striving to get rid of debt, and that you would appreciate their support. Really, the best support your system can provide you is to not always be tempting you with expensive outings. Ask friends and family if you can do more home-based entertaining – they should know you’re on a budget! Invite everyone over for a potluck dinner. Have movie nights at home. Engage in baby-sitting exchanges. All of these efforts are fun and inexpensive ways for you to enjoy the company of those you love without spending a great deal of money. Watch out for those who try to pressure you into buying expensive gifts for holidays and birthdays, as well as those who think that eating out is the only way to have an enjoyable time. People who know that you are trying to pay off debt, yet still try to encourage you to pay money, and who are unwilling to find less expensive alternatives, are not truly your friends. With the right support system around you, you can make better financial decisions, and pay off your debt quickly. Are you needing to pay off debt? Do you have some people in mind that would be a good support system? Leave a comment! This article was originally published October 4th, 2012.